Calgary A.B. 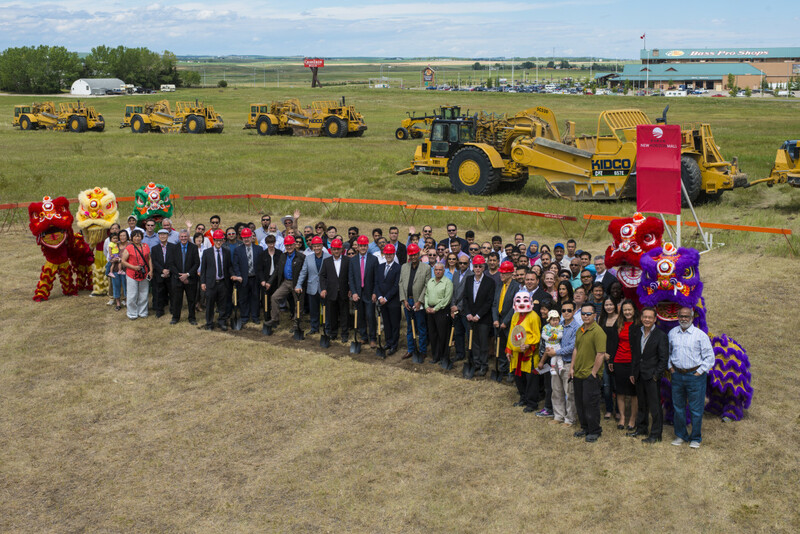 New Horizon Mall, a new type of Asian-themed shopping centre never seen before in Alberta, broke ground today with a multicultural celebration marking the beginning of construction on the new $200 million project. Developed by the Torgan Group and MPI Property Group, New Horizon Mall, is the first shopping mall in in Alberta where each retail store is purchased not leased. Stores may be either owner-operated or leased to a retailer by the owner. Once open, over 500 new businesses will be launched as each retail store is leased similar to a typical condominium. More than 1,000 jobs will be created directly and indirectly during the construction of the mega mall. The new shopping centre will feature twice as many stores as Calgary’s largest conventional mall. The groundbreaking ceremony featured more than 150 new business owners and a performance by the Jing Wo Lion Dance Team on June 23, 2016. More like an Asian or European Bazaar, New Horizon Mall is a unique, traditional Asian shopping concept. It offers a colourful allure of traditional upscale retail stores set in the comfort and beauty of a sublime, contemporary upscale architectural masterpiece. The mall will include at least 500 unique stores, a main stage where multicultural events will be held, a food court that seats 300 shoppers and will feature Asian and international cuisine and local specialties from dozens of national and independent, owner-operated restaurants. Located east of Alberta Highway 2 and north of Stony Trail across from CrossIron Mills in Rocky View County, the Mall is within close proximity to predominately Asian and multicultural communities in Calgary. The Torgan Group developed the incredibly successful Pacific Mall in the Greater Toronto Area, which follows the same Asian style shopping concept as New Horizon Mall. For over 30 years, the Torgan Group has been a leader in Canadian commercial real estate development and has developed, owned and managed more than 70 commercial projects. Its partner, MPI Property Group has been developing large-scale residential, commercial and retail projects throughout Canada and the United States for more than 25 years. In addition, New Horizon announced that Ledcor Construction Limited has been chosen as the builder for the project. Ledcor built CrossIron Mills so the company is familiar with the area and projects of this capacity. The construction is projected for completion in late 2017. “We are pleased to be given the opportunity to build this project. It is a very exciting development and we will be working closely with the Torgan Group, MPI Property Group and their store owners to bring the vision of the mall to life,” says Jim Beeton, regional manager of Ledcor. Century 21 Bravo is the real estate agency selling units for New Horizon mall, with realtor Wasim Elafech leading the charge. Elafech was recently named Century 21’s No. 1 worldwide salesperson in 2015. With 270 transactions, the Calgary-based realtor beat out 100,000 other agents to earn the title. New Horizon Mall will be a total of 320,000 sq. ft. with 500 retail units on the main floor ranging from 285 sq. ft. to 855 sq. ft. priced between $170,000 and $750,000. Photo Caption: From left to right- Philip Duchen, Moar Cohen, Rocky View County Cr. Rolly Ashdown, Rocky View County Cr. Lois Habberfield, Reeve Greg Boehlke, Eli Swirsky, Prab Gill (MLA for Calgary-Greenway), Blake Richards (MP Banff-Airdrie), Jamie Kleinsteuber (MLA for Calgary-Northern Hills), Prasad Panda (MLA for Calgary-Foothills), Russell Jacobson, Sam Cohen. Jing Wo Lion dancers and purchasers bookend the group. New Horizon Mall is a $200 million mall only 20 minutes from downtown Calgary and directly across from CrossIron Mills in Rocky View County. The mall will be comprised of at least 500 unique stores, a banquet hall, a traditional Chinese stage and a food court with room for 300 shoppers. Tailored to Calgary’s sophisticated market, the malls visionary retail experience, proven in major markets throughout the world, offers exotic colourful allure of traditional upscale Asian retail stores set in the comfort and beauty of a sublime, contemporary upscale architectural masterpiece.